Wonky is a fun card game mixed with blocks where you're trying to get rid of all your cards without toppling over the tower. Play big blocks on top of small ones to hinder your opponents or use a reverse play for payback on someone else. This block stacking card game is great for almost all ages and a fun family favorite. Wonky is easy to learn how to play and you can get the official Wonky rules and instructions for free below. 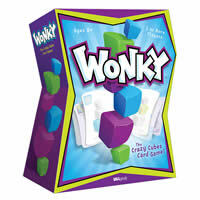 Have a blast at your next game night with Wonky. Buy this game today. Be the first player to play all of your cards as you successfully add blocks to the tower and you'll be the winner. Inside your game you'll see 9 custom wonky blocks, 54 strategy cards, a storage bag and the official Wonky game rules and instructions.